Is it possible to cross Switzerland without using a vignette? We're planning a road trip from Germany (Frankfurt area) to Italy (Milan area) next summer. The main focus is on driving on nice roads so we want to avoid driving on highways. 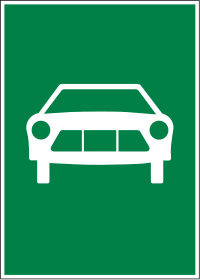 We don't mind if we have to pay for some alp passes but we want to avoid buying a vignette (motorway sticker) for Switzerland. Is that possible? It is totally possible to cross Switzerland without a vignette and avoiding motorways and expressways, as @jcaron mentioned. 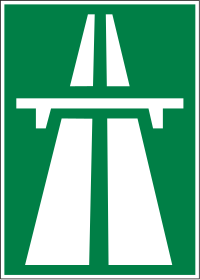 Swiss highways are indicated by green signs and are usually easy to spot. Ramps are clearly labeled before the approach. If you pay a little bit of attention you will easily be able to avoid them. 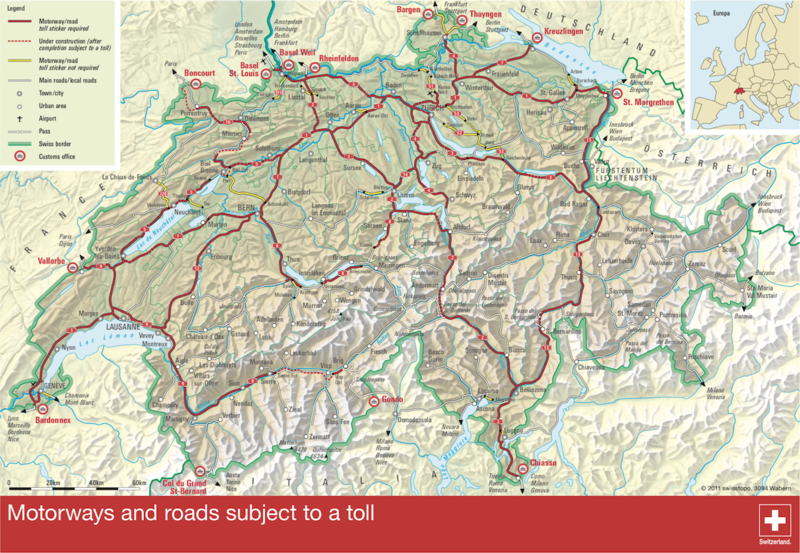 It is a good idea to get a detailed map of Switzerland such as the official 1:300000 map. This map will allow you to find your way avoiding main cities (if you want a timely travel) by aiming at the main roads crossing smaller cities and villages. Beware of the 1:1000000 map which may not have enough details to do it reliably. Google Maps can probably get you through if you ask it to avoid toll roads and highways, and always keep an eye on the color of the signs. When you reach the Alpine area, several passes are open year-round. The TCS has a comprehensive list (in german, french and italian) of passes with expected opening dates. The Simplon pass with an approach from the west (Valais) comes to my mind first, and involves a single pass. The traffic is pretty heavy with many trucks though, so if you're after nice roads you may want to try the Julier/Malojapass which goes through Graubunden (Chur). I have never taken the Lukmanier-Pass, but it should also be open year round too and also involves going through a single pass if you follow the Rhein valley. The passes I mentioned above are open year-round, except in case of especially snowy weather when they can get temporarily closed. This happens a few times each the winter season, after which they will quickly be cleared. From roughly October through May you should absolutely expect at least some snow and ice on the road and have proper winter equipment with you. Although there is no legal requirement other than maintaining control of your vehicle at all times, you really want some snow chains in your trunk. Even in summer, we usually say it may snow at 2000m altitude any day of the year. That totally includes June, July and August. All the passes I mentioned above get close to those 2000m, so be prepared. In case of uncertain weather, the Simplon pass is an especially safe bet as you can board the Brig - Iselle(IT) train with your car if the pass is closed. This will allow you to stay in elevations of under 700m which will be passable most of the year. If you feel like it you can also load your car on the Lötschberg tunnel in order to avoid a long road trip through the west of the country. Starting from June 1st every pass is open, often even earlier, with the Furkapass, Nufenenpass and Saint-Gotthard typically being the last ones to open, and remain so until October. On the Frankfurt-Milan trip, the Saint-Gotthard pass is probably your most direct option with a wide, well maintained road and definitely worth the drive. The Saint-Gotthard massif offers sevral alternative routes, for instance through the Grimsel and then Nufenen or Furka passes. These will offer somewhat smaller and maybe less busy roads, but will extend your travel time significantly. Be careful though, in my experience the time given by Google maps is extremely unreliable. The same applies to most car GPS systems. You are going to drive through the fairly densely populated region of the Swiss plateau. This means you will be going through many urban areas, with plenty of low speed roads, villages, cities, traffic lights and traffic jams before you even hit the Alps. Cows are the least of your worry even if you get lost on very minor roads. Tractors, trucks and other slow vehicles on curvy roads and villages with no possibility to pass for extended distances are an absolute certainty. Make sure you allocate significantly more time than your GPS and Google suggest, and I mean significantly. Maybe add both numbers. While I have never done it myself, I would plan at least a full day to cross Switzerland through the normal roads in summer. It isn't such a big problem in June when the sun goes down late, but you really don't want to end up on the top of a pass after sunset. The roads will be clearly marked in order to be passable by night, with white bands on the side of the road and reflective panels in significant turns. But by night headlights from crossing cars and constant turns in the winding roads will quickly make you too tired to reach your destination safely if it is more than a few dozens of kilometers away. The same applies in case of thunderstorms, which are frequent in the Summer season. In a 2 days trip from Germany make sure you sleep somewhere close enough to the Alps to start the crossing early in the morning. In any case keep in mind that any road closure will set you back several hours at best if you need to go back down and take an other pass. Keep an eye on the TCS trafic info page that lists road closures, and make sure to select "passes" to get the relevant information in winter. As you mentioned you are an experienced driver it is unlikely you will end up on the motorway by accident in the first place. I would have no such worry myself. But for the sake of completeness: if you enter the motorway and the police catches without the sticker you will be fined CHF 200.- and I expect in addition you will have to purchase the sticker on the spot (CHF 40.-). If you change your mind on the way and decide to use the motorways, you can purchase the sticker at the border, in every post office (within the opening hours of course) and at most gas stations. Have a nice drive through Switzerland and enjoy the scenic views and mountains! When travelling through Germany, I remember views from highways to be really boring... But in Switzerland it was different and even the highways gave me spectacular views of mountains, waterfalls etc. With the spare time we gained by travelling on highways I've decided to visit Islabord with such a spectacular view: https://www.youtube.com/watch?v=eq8nFt7ixk8 Roads leading to this place were interesting as well - narrow and remote. So if you aim for the views, you can still consider traveling by highways and visiting interesting places for the views. Yes, the vignette is only required for motorways and equivalents. If you avoid those completely, you don’t need a vignette. Note that I wouldn’t be too surprised if there were a couple of places where you have no choice but to use a road requiring the vignette, so you’ll want to double-check your itinerary. For instance, the St Gottardo and St Bernardino tunnels require a vignette, but are always open; the St Gottardo and St Bernardino Passes (no vignette required) sometimes are closed. Google Maps seems to find itineraries going from Freiburg im Breisgau to Milan without highways, but they're a lot longer than the highway (over twice the duration). In some instances it even sends you through Liechtenstein... I wouldn't be surprised if in some situations, switching to a highway for a few km could save you hours (and give you a lot more flexibility, if time is not of the essence). 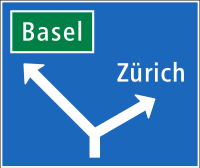 Of course, you’ll have to enter (and exit) Switzerland by a regular road and not a motorway as well! Not the answer you're looking for? Browse other questions tagged driving switzerland road-trips vignettes or ask your own question. Can I buy a vignette for Hungary (Matrica) online? Didn't purchase an Expressway / vignette before driving on highways in Czech Republic. What can I expect? Exploring Switzerland with a car - where can I park? Switzerland - sleeping in the car?